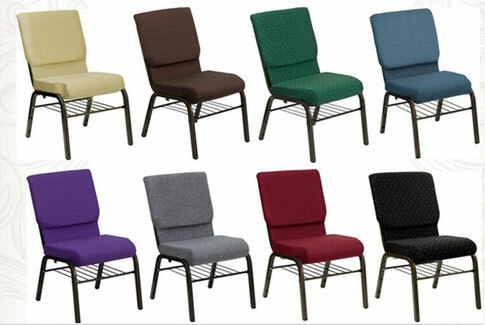 Church Chair will add elegance and class to any Church,Hotel,Banquet Room or Conference setting. This chair was built to last featuring a sturdy 16 gauge frame and has been tested to hold a capacity of up to 800 lbs. The flexibility that you will have over pew seating is an advantage when wanting to create different seating configurations. The waterfall front seat edge removes pressure from the lower legs and improves circulation. This chair includes a convenient book pouch on the backs for hymn books and bibles. The included book rack allows congregants to store personal belongings during worship. You can create uniform,row seating with the included ganging brackets on either side of the chair. The plastic floor glides will keep your hard surface floors scratch free when moving around.